Proper medical practices were not followed by the police and he died in hospital the next day. If standard medical practices were followed, TJ would probably be alive today. As is the norm in all police-initiated Black Deaths in Custody, the cover up started immediately. Every one was involved, from the then Premier, Bob Carr and to the Police Commissioner. Even the State Coroner did his bit by placing very tight conditions on what could be presented to him in the ‘manufactured’ police Brief of Evidence. The Hickey Family’s legal team, forced upon the Family, blocked some witnesses, did not give proper legal representation to TJ’s Family, and stopped, or agreed to, some crucial evidence not being presented in Court. Whilst the police were exonerated, despite their admitted collusion of evidence, those Aborigines who were provoked by the Redfern Police and vented their collective anger and grief, as was to happen on Palm Island, Qld, at the death in custody of Mulrunji Doomadgee by Snr. Sgt. Christopher Hurley in November, 2004, were found guilty and gaoled. Another corrupt whitewash had occurred. On Palm Island, Snr Sgt Christopher Hurley. in the Police Station, assaulted Mulrunji so badly that he died shortly after on the cell floor, in great pain arising from his injuries that included 4 broken ribs and a split liver. As usual, in these cases, the cover up started immediately with police, working friends of Hurley, ‘investigating’ the circumstances. But something went very wrong for the Qld. Government and their police. The Palm Island Community, and the solidarity of the Brisbane and Queensland Communities, firstly, and then later from all around Australia, demanded JUSTICE. Two Coroners, a long enquiry, Government, police and DPP pressure that was resisted, meant the cover-up failed. 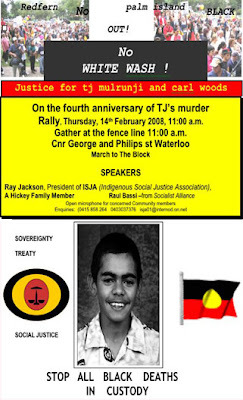 The acting State Coroner, Ms. Christine Clements, recommended that Hurley face Court on charges of killing Mulrunji. Still the corrupt forces of injustice kept working. The DPP ‘found that Hurley had no case to answer’. And again Aborigines from Queensland and their Supporters around the Nation came out demanding JUSTICE. The then Premier, Peter Beattie, was forced to accept the outcome of this struggle and a new enquiry by Sir Laurence Street recommended the charges against Hurley be reinstated. But eventually, when the Trial was held, “White Australian Justice” was at work and Hurley was acquitted by a racially picked jury. THE IMPUNITY AND INJUSTICE, AS FAR AS POLICE DEATHS IN CUSTODY IS CONCERNED, FOR TJ, MULRUNJI AND SO MANY OTHERS WAS CONFIRMED ONCE MORE. at the hands of the police?